Home › Bethel "Church" › Bethel’s house of cards; tarot-rists leading people to Baal/Jezebel by practicing occultism in God’s name. After reading this article, people should now know to avoid Bethel, Redding in California and Christalignment because of their engagement in witchcraft and demonic practices. We advise readers to prayerfully consider what you are about to read as we lift the lid of what is lurking beneath the occultic Christalignment ‘ministry’. We are aware that the content in this article is not suitable to some readers who are young in the faith. In the bible, idolatry is often connected to ‘spiritual adultery’. This is because our God is a jealous God and speaks against raising up idols or other ‘gods’ before Him. When we look at Jezebel, she seduced King Ahab and led Israel in her wickedness to ‘fornicate’ with Baal. 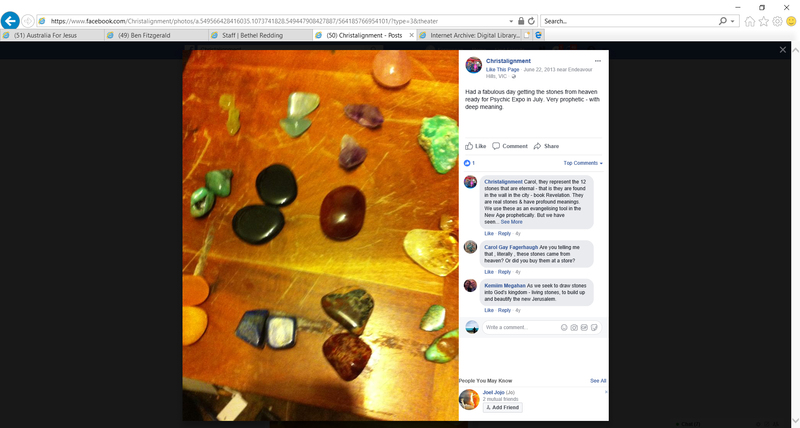 Christalignment engages in the occultic practice of not only tarot (destiny) card readings but New Age gemstone practices and the use of henna tattoos. In most cases, Jezebel could be regarded through the lens of the bible as a witch. This is also due to the fact that occultists and New Agers not only look to Greco-Roman female deities or idols (Hecates, the Three Fates, Artemis, Athena, etc), they also look to the ancient gods of Babylon such as Baal (a fertility god) and Anat (a violent war goddess). We will be dealing with all these categories in depth (except good/bad energy practices), comparing their destiny card practices to the original occultist practices and see how they are no different. We will look at why they use ‘agate’ with their card readings and last of all, we look at why use of henna tattoos are a common practice found in all new age festivals and contrast this ‘ministry’ to the work of Jezebel in the bible. Wikipedia has an informative entry on the history of occultic tarot cards. Yet Bethel tolerates this ‘Jezebel’ Jen Hodge. But take note that occultic/New Age tarot reading can be assisted with crystals. Had a fabulous day getting the stones from heaven ready for Psychic Expo in July. Very prophetic – with deep meaning. Carol, they represent the 12 stones that are eternal – that is they are found in the wall in the city – book Revelation. They are real stones & have profound meanings. We use these as an evangelising tool in the New Age prophetically. But we have seen stones that have fallen from heaven to here. God sends all colours & all manner of stones. He loves them & the colours have significant meaning, should you ever receive one. The ancient Israelites were forbidden to be like the gentiles who would often engage in slashing, marking or tattooing themselves. Today our modern pop culture celebrates the occult. TV shows are engaging in characters cutting themselves to make blood covenants or to summon spiritual beings and even promoting forms of henna tattoo art. For instance, in Madonna’s video clip ‘Frozen’, she is taking on the form of the ‘Three Fates’, the end showcasing her henna markings. However, henna tattoos are not promoted in a favorable light but linked to occultism. Various New Age sites that use henna tattoos link it to ancient spiritual rites and practices in ancient Egypt – henna tattoos found on their mummified bodies. But some are darker than that – in ancient Semitic religions, there is supposed historical documentation that the violent and mighty war goddess Anat (Anath), who is second to Baal, adorned herself with henna and dressed for an occasion (a questionable occasion according to historians and mythologists). The occasion was to celebrate Baal’s victory over the overarching ruler of all Semetic deities – Yam. After the celebrations, Anat left to slaughter Baal’s enemies. Wikipedia states, “The earliest text mentioning henna in the context of marriage and fertility celebrations comes from the Ugaritic legend of Baal and Anath,” linking this information to the work of Jahonnes C. de Moor titled ‘ The seasonal pattern in the Ugaritic myth of Balu, according to the version of Ilimilku ‘. While it is important to respect history and archaeology and appropriately question if this story is true, occultists and New Agers have popularised this henna/Anat notion. So it’s not a leap to make the claim that the spirit behind New Age henna is pro-Baal and anti-Christ. Once again – in opposing God the Father, Son and Holy Spirit – occultism and New Age practices elevate strong female deities. This is probably why henna tattoos are more often worn by females in the occult and New Age festivals than men. Many people get tattoos without there being a spiritual motive connected to the occult. Often it is simply an aesthetic or cultural thing. However, the use of henna tattoos seems to be directly connected to practicing paganism or occultism. The fact that Anat adorned herself with henna before slaughtering Baal’s enemies would attract occultists and New Agers to engage in such a practice. Occultic and New Age aesthetics are often a reflection on the deeper meanings behind spiritual rites, images and practices. Interestingly, there are loose references of Anat in the bible in the names of ancient places. When we look at the nature of Jezebel, she seems to personify this mighty war goddess. Similar to Anat, Jezebel was an ally of Baal slaughtering his enemies, “killing the prophets of the LORD” (1 Kings 18:13). We assure that some will accuse us of drawing a long bow to connecting the practice of henna to ancient pagan practices in connection to their deities. But one simply needs to ask WHY New Age people practice this. Why the fascination with Egyptian and Semitic pagan practice? And WHY are Christalignment even doing this at all with its connections to Baal and Anat? Anat, Jezebel and the New Age movement all have one thing in common: they are all against God’s people. So why use henna tattoos at all if it is used similar to war paint to mark who they are and what they are against? As Christians we are marked and sealed by the Holy Spirit. However, regarding Christalignment, they are ENGAGING with this pagan form of tattooing that sets itself AGAINST God. In the screen grab at the bottom of this article, you can see they are not only marking children, they are painting pagan symbols such as pagan dream catchers, New Age lotus flowers, animal totems and occultic imagery/tools on people. What’s shocking is that just like Jezebel, Jen Hodges is using the authority of her son’s name to entice Bethel students to engage with her ministry, just like Jezebel used Ahab’s authority to justify her godlessness. She is inviting Bethel students to join with them and name-dropping (Ben Fitzgerald) to imply what they are doing has Bethel’s approval. Bethel leadership has the audacity to not only tolerate this modern ‘Jezebel’, they publicly endorse Jen Hodge doing this apparently in the name of Christ! To end, we show a screen grab of Christalignment’s page promoting their henna art. Click on the image below to enlarge their page on henna art. ‹ Jen Hodge – the truth is not in her; lying to Kris Vallotton and misleading the body of Christ.